Apologies, I have not mastered the art of a short race report. 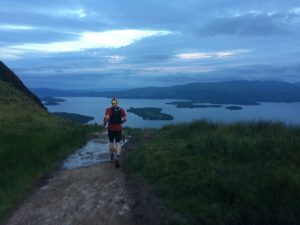 I first went to a West Highland Way inspiration evening back in 2010, I had watched clips of the headtorched runners setting off in the dark up through a shopping precinct to shouts and cheers on YouTube long before I had entered the Fling or ever set foot in Milngavie, I crewed for Chris in 2016, entered, but did not get a place so volunteered in 2017 and finally 2018 I was on the start line! Its felt like I have always been heading here. I love Milngavie train station carpark. How a carpark can give me chills, I am not sure but every time I am here I get the same feeling, it must be the anticipation and the buzz. I registered and milled around chatting to friends old and new. 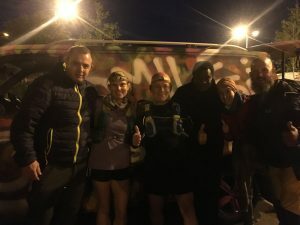 Chris soon joined us with his support crew of Juliane and Ngeme and we got a few photographs and in no time it was nearly 1am and we were getting our briefing and lining up ready to go. Alan and Yan, Ngeme and Juliane had gone up into the High Street to get the full effect of all the runners coming through and as we ran through the tunnel of supporters they shouted and cheered me on as I passed. Once onto the Way proper I settled down into my pace, tried not to get carried away or run too fast and watched my feet as the headtorch picked out the rocks and tree roots. It was pretty cool running this section in the dark when every other time I had been here it had been daylight. Even though it was the middle of the night, it was such a clear night it never felt completely dark, it was really calm and there were bats flitting around the sky. The first milestone arrived at Drymen, and although not a checkpoint I knew Alan and Yan were going to be there to see me. 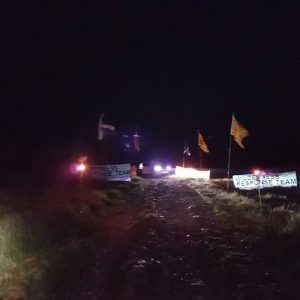 As it is only around 3 in the morning, everyone is tasked with keeping very quiet so as not to wake the neighbours, so there was lots of silent cheering and quiet hand clapping, as I reached the top of the hill I saw Yan and Alan and after a quick hug I carried on. I walked the climb through the gorse and trees just out of Drymen and tried to take on some food, I am not normally very good at eating on ultras but I knew that I had to be or I would seriously struggle. 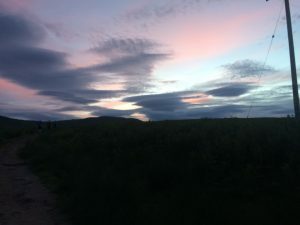 As we approached Conic Hill the sky was brightening as the sun was rising and I pocketed my head torch. 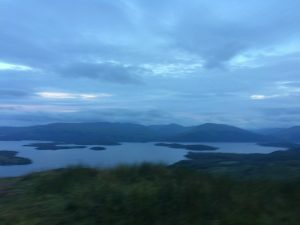 This is one of my favourite sights as you climb Conic Hill and then round corner and Loch Lomond and all its little islands open up in front of you. I was caught behind a few people picking their way gingerly down and I was tempted to try and blast past them as I would in the Fling, but I took my time and sat behind them, I was going to be out for a long time and there was plenty of time to get by further on, plus we were just about to come into our first checkpoint and I was going to be seeing Alan and Yan so patience was the name of the game. 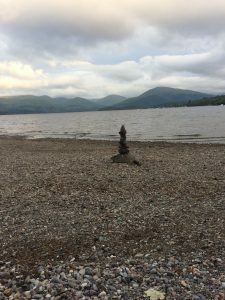 As I came into Balmaha I was greeted by a sea of crews in head nets as the midges were out, I followed Alan and Yan to the car and had some breakfast, handed over my headtorch and got sprayed head to foot in midge spray and was on my way. I had spent ages pouring over previous years race splits from people who had done the Fling and the WHW in previous years trying to figure out how long realistically I would take. I would not normally bother and just like to run to feel and see how I get on, but I had a crew to think about too and wanted to give them an idea of when I was going to rock up into checkpoints, I did not want to be worrying about phoning them and not having signal so I was really pleased and surprised to arrive at Balmaha, 19miles in and 9 mins ahead of my scheduled time. 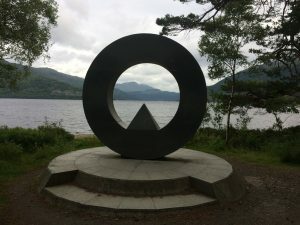 The next few miles went in a bit of a blur, I was looking out over the Loch, chatting to other runners, reminiscing and day dreaming and just enjoying running and it felt like no time at all I was running into Rowardennan. Once again my fantastic support crew were there refilling my water, giving me food and being full of encouragement. Juliane gave me some friendly words and as I walked out I waved at Ngeme sitting in the back of his car with his headnet on, I had to eat my banana really quickly as the midges kept sticking to it and by the time I had got one off another 3 got stuck! It was 7 in the morning, the sun was up and I had been running for 6 hours, it was bizarre to think it was still so early, I felt like it should have been at least lunchtime. 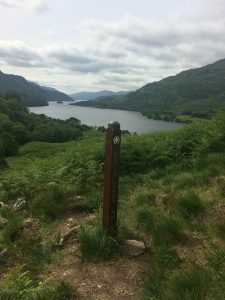 I was looking forward to the next section as it included the low route along the Loch and I had never been that way before, the Fling always takes the high route so it would be the only part of the route that would be virgin territory for me. It was much more in keeping with the route further on as it snaked up and down and had rocks built into the path and I trotted on keeping my eyes open for the wild goats that hang around this section that I had spotted in the Fling, but there were no goats to be seen today. 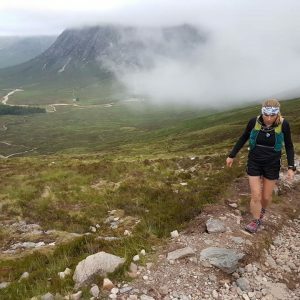 As I leapfrogged other runners I was trying to keep a good pace up but as I arrived in Inversnaid I was feeling a bit tired, there are no support crews at this checkpoint just dropbags. 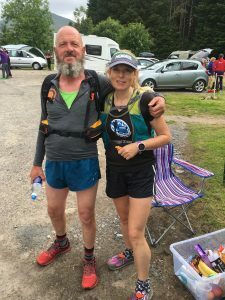 I grabbed my bag and stood by the tables chatting to some of the other runners while I refilled my water and peeled my orange, it was starting to get quite warm and I walked out of the checkpoint chatting while I scoffed my crisps. The next section is a bit like marmite with some people loving it and others hating it. I personally love this bit, all the clambering over rocks and up and down and hauling yourself over the course. The final ladder under my belt the path winds it’s way through open countryside and the ferns were chest high, I realised I have only ever covered this route in early spring and seeing it at the height of the growing season was a first for me, I wound my way through the ferns and as they whipped at my legs they cleared the remains of the dead midgies that had covered me had since Beinglas, I did worry that they might be replaced by ticks but luckily I avoided that this time round. My arms on the other hand remained a bit of a graveyard. I climbed up to Dario’s post and gave it a pat and took another photo of the view I have taken so many times before up the Loch. A couple more miles and I ran into Beinglas Farm, 42miles and 12 minutes ahead of schedule where once again Alan and Yan were waiting. A quick refill and I was off and out again, Alan and Yan were shouting my name and cheering so loudly that other support crews and marshall’s joined in and I ran out of Beinglas laughing to hoots and hollers and shouts of Go Gilly! I was still on a high and running well as I hit the ups and downs of the next section. I started walking a bit more up the hills and running the downhills and flats where I could. In no time I was onto Cow Poo Alley, much drier and easier to navigate than it had been in April and again chatting to some other runners including a guy named Kevin who had been hoping for sub 24 hour but had been struggling on the earlier sections, we had passed and chatted with each other a couple of times before but he seemed to get a bit of a second wind and this was the last I saw of him in the race as he went running strongly towards the rollercoaster. When I reached the rollercoaster myself I took it easy on the uphills but just jogged gently down the downhills, I was reminded about how I needed to look after my quads so that they would still be good later on in the race. As I came into Auchtertyre I was at 51 miles and what is generally considered the half way point and 15 mins ahead of my predicted time. I was swept up by my crew, weighed and had some food but I was beginning to feel pretty tired physically, but I was glad that mentally I still felt good, I thought that I might have been feeling the effects of being up and running for 13 hours and it still being only 2pm. 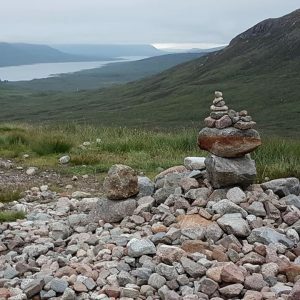 I could have had a support runner from this point but I had decided that I was going to wait until Bridge of Orchy for Yan to join me, so I walked out and headed towards Tyndrum. 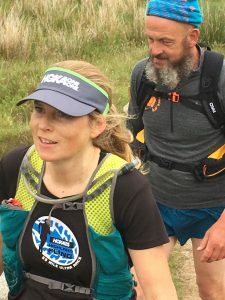 This was one of my low points in the race, it was hot, I was tired and I was just walking, I think I was feeling a bit down as I was still on the Fling route and I felt done in, how was I going to cope with the next 44 miles? I started to run but was just feeling flat, my friend John ran past me running strongly with his support runner and I cheered him on but wondered if I should have had Yan running with me after all. I kept walking and running only very short distances before I started walking again and as I walked through the Tyndrum woodlands, I looked over and could see Alan and Yan drive by in the Landrover. I ran/walked along the river and as I came up to By The Way there was Alan and Yan, they had seen me and come down to give me a bit of encouragement. After a minute or so I was back on my way with them driving off tooting and shouting. 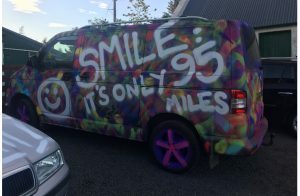 I started jogging until I came to the road crossing and walked up past Brodies where other crews were parked up giving some motivation to the runners. I walked to the top of the hill and then I started running, and I kept running. Whether it was my walking break, the lift I got from seeing Yan and Alan, or the fact that I was now on the Devil course or a bit of all three I was feeling good and ran more or less all the way into Bridge of Orchy, as I was beginning to wonder where on earth the bloody station was that never seemed to come into sight, I caught up with another friend, Ross had started strongly and I had only seen him briefly on the course right at the start before I needed to take a pit stop and was wondering if I would catch up with him again. He was feeling the effects of the 1am start and the fact that he had been up all day Friday with no sleep or rest, as we chatted he started running with me and we ran into Bridge of Orchy together, he had planned on taking a 10 minute cat nap in the back of his car which had been kitted out with a mattress. We were now at 61 miles and I was over half an hour ahead of my predicted time, poor Yan was having a sleep in the car so he was rudely woken up! I had a seat, which I think might have been the first time I had sat down in the race and had some home made soup, which tasted awful for some reason, but I ate it all anyway, changed my t-shirt and then we were on our way, Yan went bounding up the hill, for me to shout that I was only walking up the hill! It was good to have someone with me and we climbed the hill chatting as we went, when we got to Jelly Baby Hill, Murdo was there dispensing his Jelly babies (for those interested I had an orange one, the same colour as David McLure, the winner had – I was hoping some of the orange magic might rub off on me) and there was someone (sorry don’t know their name) playing Superman on a tin whistle. 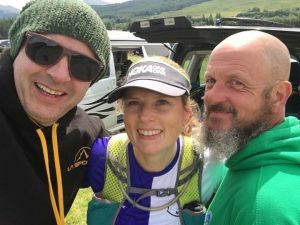 Before long we had made it to Rannoch Moor and were once again leapfrogging runners and friends – Ross having benefited from his catnap and passing me and us catching up with John who was suffering with terrible blisters. 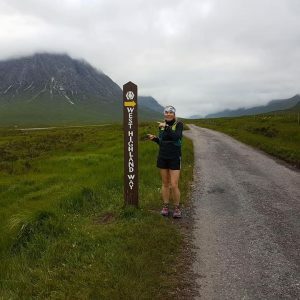 Rannoch Moor seemed to take ages, and I realised not for the last time on this run that I am not sure how people walk this route as it takes so bloody long when you walk it – much prefer running it, when my legs allow! 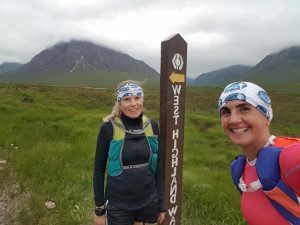 As we reached the highest point I managed to get some more sustained running under my belt and we ran into Glencoe where Sadie, Billy and Skye were waiting for us. I had now covered 71 miles and was 10 minutes ahead of my guesstimated time. I had decided to have some hot food here as it was about 7.30pm and I had wanted to try and stick to normal meals at normal times as much as possible. I had made up some mashed potato and salmon and was surprised by how much of it I ate. I stuck on my thermal top as although it had been a beautiful warm day I did not know how much the temperature would drop overnight but I was not ready to loose my shorts just yet so put a pair of tights in my rucksack along with my jacket. Sadie and I headed off, we ran and chatted and in no time we were ascending the Devils Staircase, the last time we had been up here was on a recce run in March with Tracy and we had every kind of weather, but today it was perfect, as Sean Stone had said in the initial race briefing, he could confirm that we would get no weather and that is indeed what we had, no wind, rain, sleet, snow, hail or indeed much of anything, unlike in March when we had all the weather! As we climbed my eyes were playing tricks on me and I kept thinking the rocks were sheep, or goats or trolls or strange men lurking in the hillside, but luckily Sadie could see some of the things that I could see in the rocks too so I was not hallucinating (although I think Sadie was looking forward to that bit!) we reached the top and started to descend and we ran more or less all the way into Kinlochleven. As we came into the woods about a mile or two out it started to get dark and we had to put on our head torches, the bats were flitting around and the midgies were coming out. We arrived at Kinlochleven, 81 miles and still 10 minutes ahead of time. This checkpoint is inside a community centre so in we headed, I was weighed, had some more soup, (which strangely tasted better this time), I brushed my teeth and then we were back out. 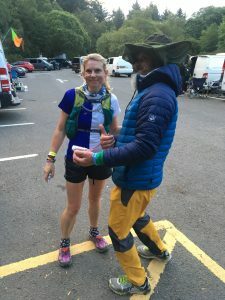 It was just after 11pm and I was surprised I was still feeling so good, I had not had any stomach issues or mental tiredness and although I was now starting to feel some aches and pains in my legs I was happy with how I was doing. The climb out of Kinlochleven was not too bad, although I am aware I was going really slowly and was passed by a couple of people who were climbing much better than me. 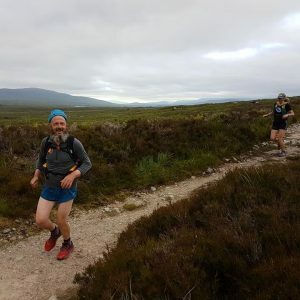 When we reached the Larig Mhor I was trying to run as best I could, but my legs were really starting to hurt and my feet were really sore. I had recently changed to Altra shoes and although I did not have any hot spots or bashed nails, they did not have the amount of cushioning I am used to with Hokas, the incredibly dry, hard and stony ground was beginning to take affect and the soles of my feet were really painful and were slowing me down. The path is also so rocky I was having trouble running without tripping or sliding around on the rocks, Sadie started to run ahead of me and I just followed in her footsteps . Not for the first time I wondered how people can walk the WHW, as the going was so slow we were taking forever to get anywhere, I was getting a headache from the head torch being tight round my head and was getting tunnel vision having no periphery vision, I was wanting to just be finished now and this was my biggest low on the run. I knew there was the Wilderness Response Team somewhere out there and the bonfire at Lundarva and this is what I focused on, just tick these points off and then I was on the home stretch but although the lights of the Wilderness Response Team came into sight, they seemed to just dance in the distance and not get any closer, after what seemed hours we were dazzled by the headlights of their truck and I wondered if they were driving towards us as they suddenly seemed to just be in front of us. We had a couple of glasses of fizzy juice and I felt better as I knew it was not too far until Lundarva, after some more stumbling over rocks and a ridiculous number of stops to pee (apparently this is a thing!) 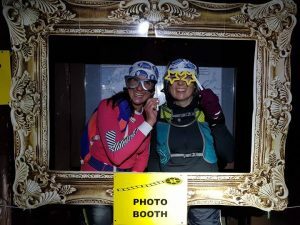 the bonfire came into sight, there were loads of people around too – and a photo booth! Sadie and I got our photo taken and then we were back on our way. Sadie texted Yan a smiley face which was his cue that we were on our final 7 miles as he was going to run part way up to meet us. I was managing to run a bit better here, mainly because of the lack of rocks and my next focus was the top of the fire road, we were still in darkness and looking for the sunrise but it was much cloudier than it had been the previous morning so it was hard to see where the sun might be rising from. I was glad I knew this part as well as I do as I recognised all the little parts that we came across and had a good mental image about where we were and how far we still had to go, we reached the top of the fire road and started to run down but my legs and feet were quite sore and I was disappointed that I was not able to run as much as I wanted to down these steep sections. Yan appeared round a corner just as we were taking our head torches off and the three of us ran (well I more hobbled) and walked through the early dawn down the fire road. We came to the Braveheart carpark and there was one mile of flat tarmac pavement to the finish at the Leisure Centre. 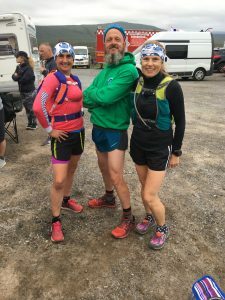 I ran/walked the road until we came to the outskirts of Fort William and then I managed to run the final section with Yan and Sadie by my side to cross the finish line where Alan was waiting for me. 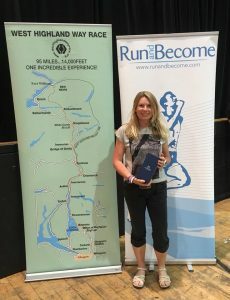 I had done it, I was a West Highland Way finisher. 95 miles in 27hrs 28mins. I was taken into the Leisure Centre, weighed for a final time, had some tea and toast, got a massage (fell asleep on the massage table) and headed back to our hotel to get a few hours sleep before the award ceremony later that day. 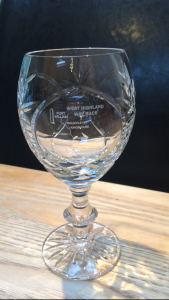 The award ceremony is an incredible experience, each and every finisher is called down in order and given their goblet, it is quite an emotional event and I think seeing the 70 year old who finished with a sub 24hour getting a standing ovation had everyone teary eyed. 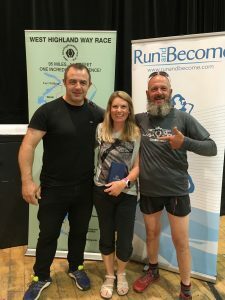 I was chuffed to see that Kevin who I had chatted to a few times managed to pull of a blinding second half and did indeed get his sub 24 hour finish but I was especially touched that Chris who had unfortunately just been timed out at 81 miles in Kinlochleven came along to see me get my goblet. Chris has been a huge source of inspiration for me since crewing him in 2016 and I know that next time he takes on the WHW he will get his second goblet and I will be there to see it. I can’t sign off without saying that they talk about the West Highland Way Family and its not just the runners who make this race so very special, it is everyone involved with it, from the race directors and committee to the crew, volunteers and supporters who give up their whole weekend, miss out on at least one if not two nights of sleep and put someone else before themselves to help them complete their goals. Thank you so much Alan, Yan and Sadie for your selflessness, I could not have done it without you. Brilliant report on such an epic race. Truly gigantic effort to finish in such a great time. Well done! I may be one of the support team if Jan gets in. Yes Gilly what a fantastic achievement; which Dave and I can appreciate having been there, as Dave says, some years ago. We took much longer than you; but all I can say in our favour – on the 6th or was it the 7th day we climbed Ben Nevis. Congratulations Gilly – superb. Gilly, Bill & I walked the WHW a number of years ago………………..in 5 days! Can’t imagine what it’s like to do it in a single session; what a fabulous achievement by you and your team, I’m in awe. (Tip for support runners, keep a stride behind so you don’t “force” the pace). I also hear you turned up at Hillend for the hill session the Thursday after. You Ultra nutters are a definitely different breed.